January 2015 n Performance & Hotrod Business n 65 "The NotcHead business stemmed right out of the DNA of Ferrambo," says Tim, who notes the line now includes cor- responding socket set, custom grips for use in polishing bolt heads, a universal dimmer switch bezel and set of line clamps (which were recently highlighted by Popular Mechanics magazine.) "The whole line has sprung out of things we were already doing in the shop in building projects," he says. Tim says that the new endeavor has brought both challenges—like learning about best practices in advertising, which the company has never had to do—and opportunities, including the ability to add a new profit center to the existing business. But at the end of the day, Divers says he's less concerned with financial success than he is about the quality of his relation- ships with those closest to him. That even means turning down potentially lucrative opportunities for exposure in the wave of popular television shows covering custom car builders. "We've had plenty of opportunities and I'm just fine looking back some day and being 'the old guy who never had a show,'" he laughs. "I'd much rather just have people think of me as a good friend, husband and brother. For a guy who grew up with plywood floors and had to learn this stuff on their own to make a living, that would be a great way to be remem- bered. That doesn't mean that you don't want to get the kudos, but the kudos can't be the primary purpose of what you do." 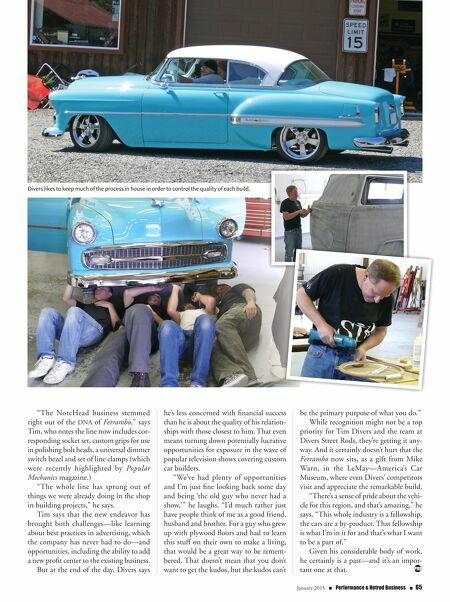 While recognition might not be a top priority for Tim Divers and the team at Divers Street Rods, they're getting it any- way. And it certainly doesn't hurt that the Ferrambo now sits, as a gift from Mike Warn, in the LeMay—America's Car Museum, where even Divers' competitors visit and appreciate the remarkable build. "There's a sense of pride about the vehi- cle for this region, and that's amazing," he says. "This whole industry is a fellowship, the cars are a by-product. That fellowship is what I'm in it for and that's what I want to be a part of." Given his considerable body of work, he certainly is a part—and it's an impor- tant one at that. Divers likes to keep much of the process in house in order to control the quality of each build.